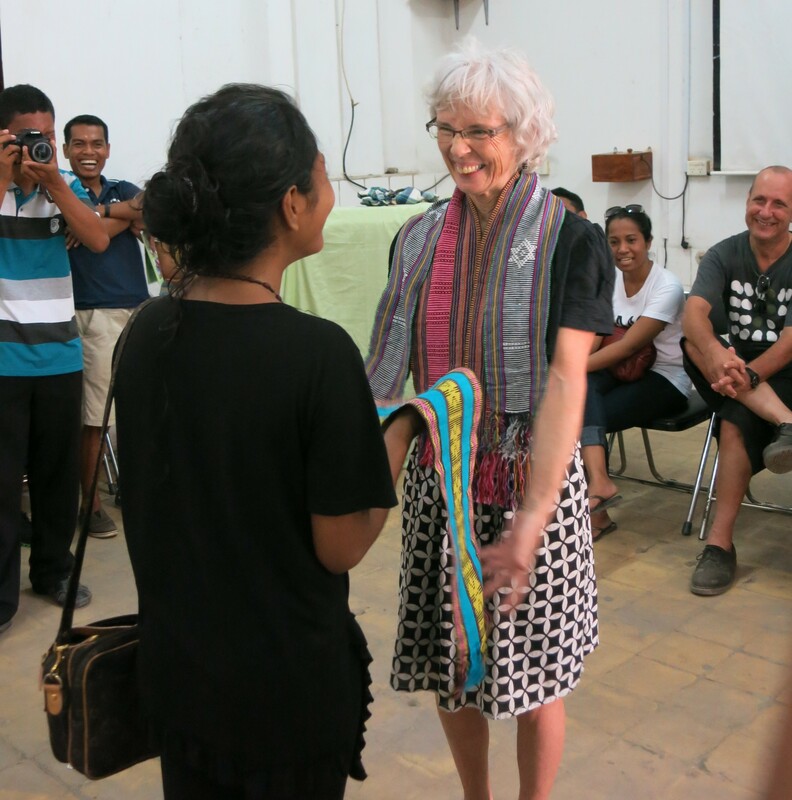 Every day in Dili is hotter than the last. 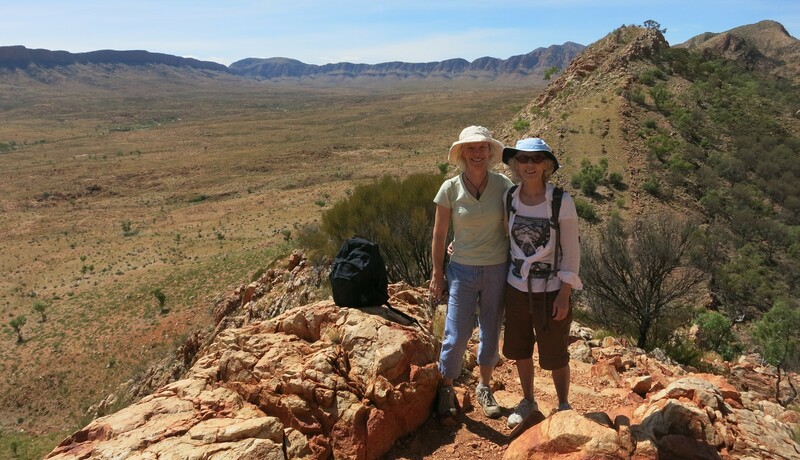 The wind gets up in the afternoon and clouds gather over the burnt hills, only to disperse. 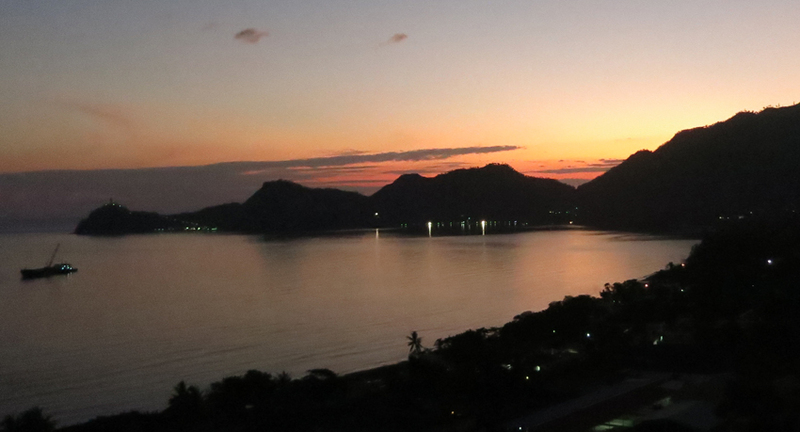 It’s late in the dry season, no rain for months. My skirt sticks to my legs like gladwrap. Dust coats the trees, the furniture, my feet. Even the sky looks like it could do with a mop. 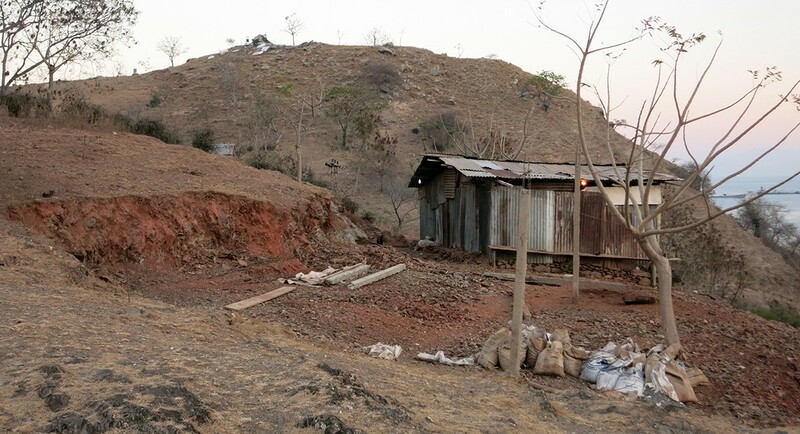 A hut perched on a barren Dili hillside late in the dry season. 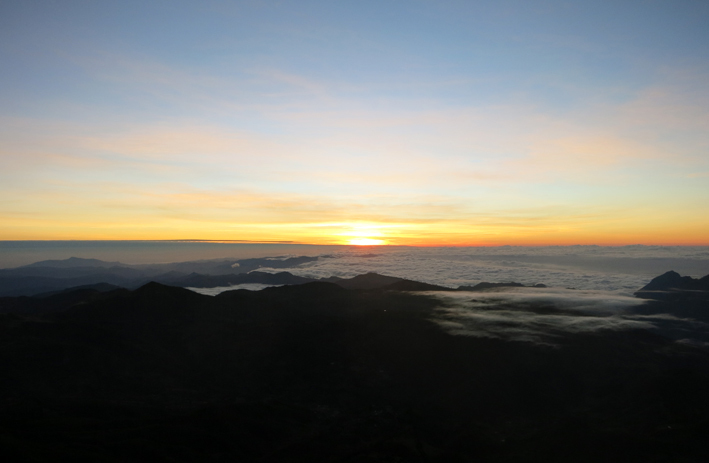 Timor’s highest mountain, Ramelau, stands at an impressive 2963m, higher than New Zealand’s Mount Ruapehu. 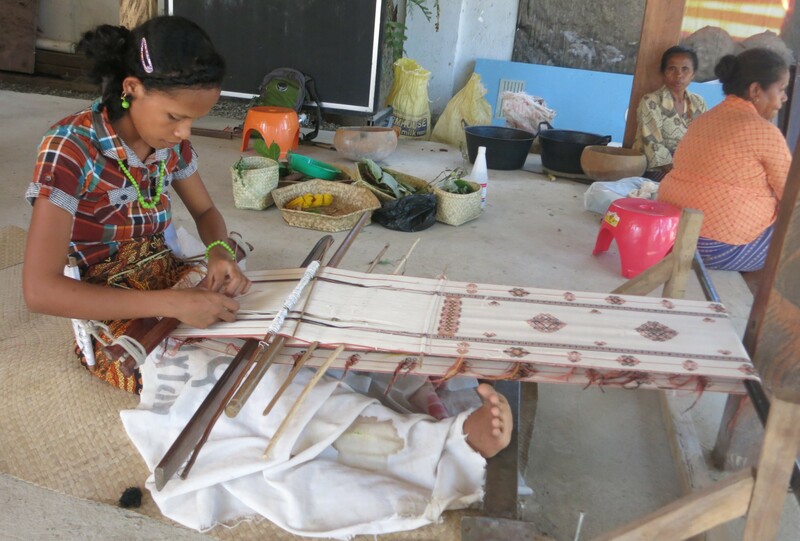 It’s revered by the Timorese as shown by its local name Tatamailau, which means ‘grandfather of all’. 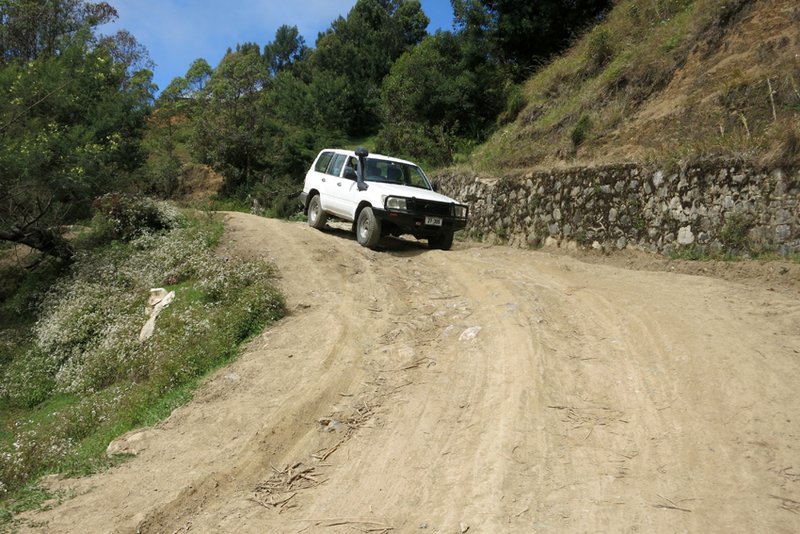 Fortunately, you can get most of the way up in a grunty 4WD if you have a stomach for bad corners. 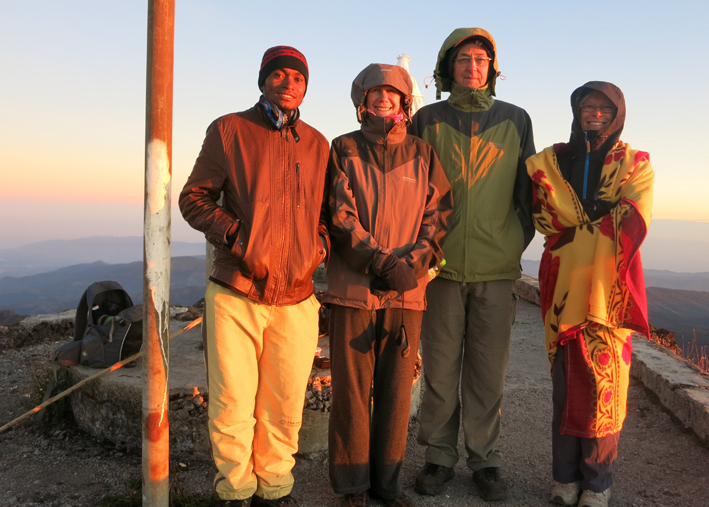 In mid-August, we climbed to the top to see the sunrise with fellow VSAers Del, Tony and Julia. Click on the first photo for a slide show of our trip, including a shopping expedition at the Maubisse market on the way home. PS Dili Dally will be on hold for a few weeks while we’re in Boston visiting our son Liam and his fiancee Aurora. We’ll be back in October. 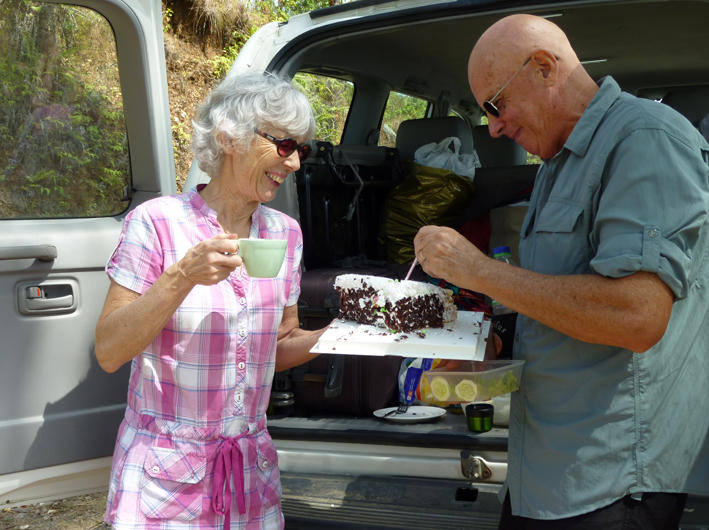 Tony and I tuck into the remains of his and Del’s 30th wedding anniversary cake during a picnic lunch in the hills above Dili at the start of our trip. 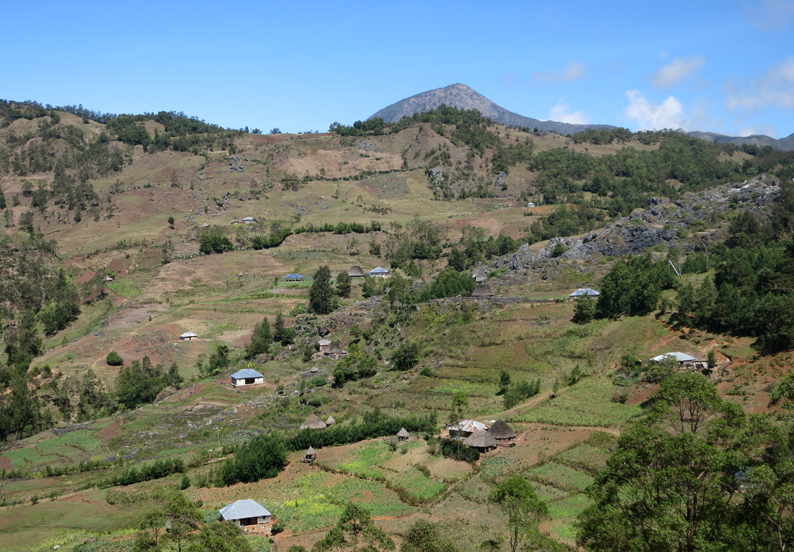 The 100 kms to Hato Builico, where we’ll stay the night before climbing Mount Ramelau, is a five-hour ordeal (without stops) in our comfy, rented 4WD. 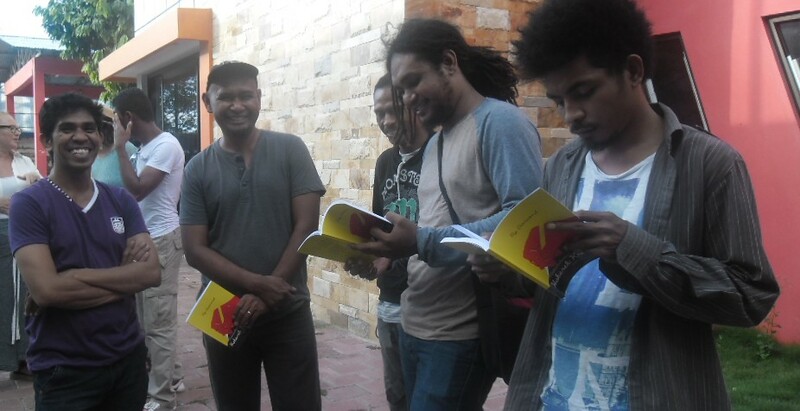 For a truckload of Timorese, it must be a different experience altogether. 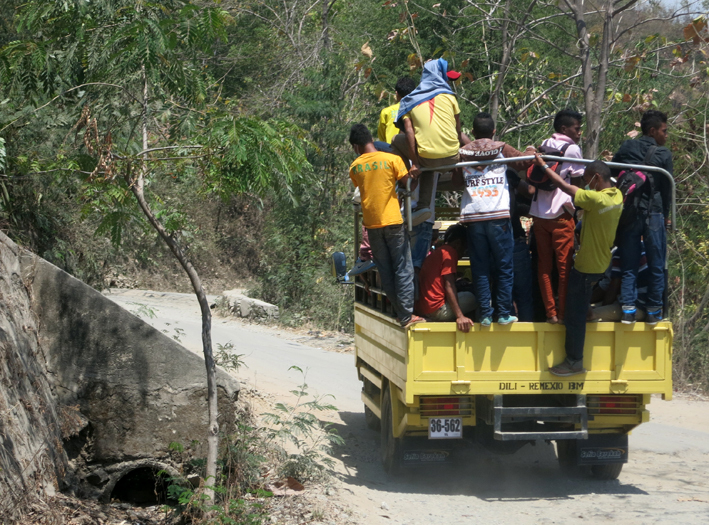 State Highway 2, the main road from Dili to the south coast, is all broken bitumen and potholes. 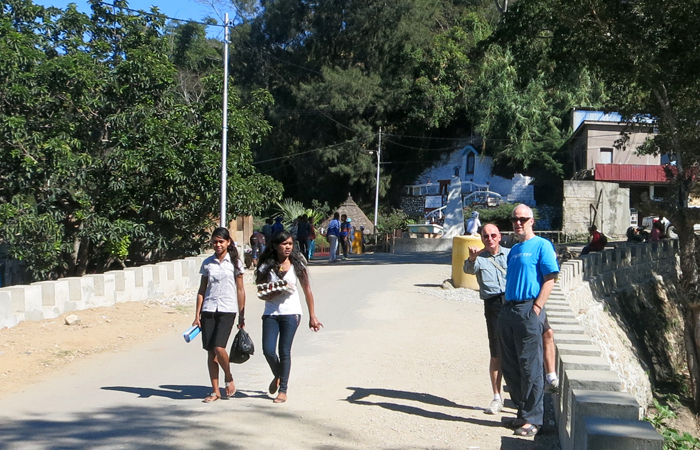 At Maubisse, 70km south of Dili, the temperature’s falling. 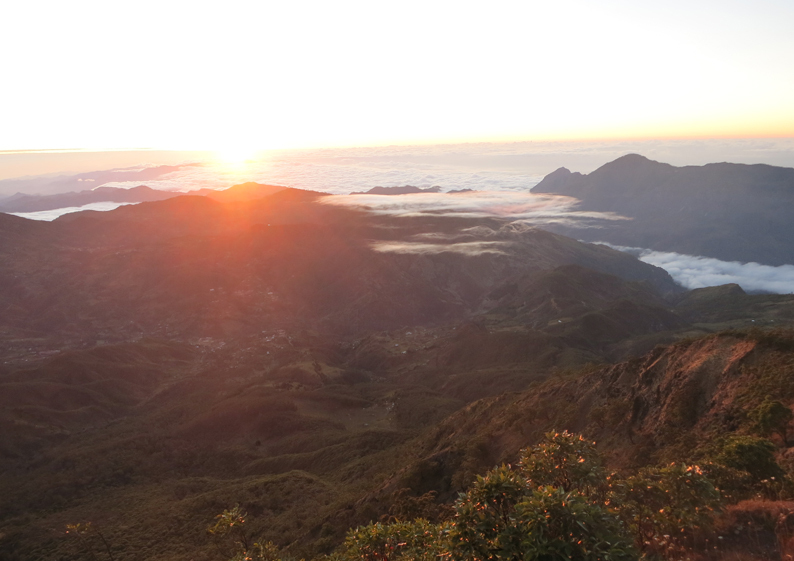 We buy water and five beanies, the town supply, for our early-morning climb. 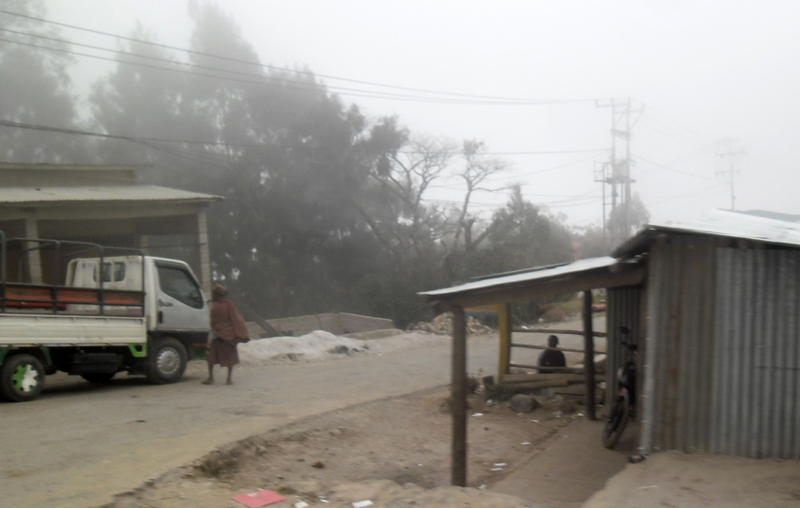 Driving becomes harder as mist shrouds the road to Hato Builico, a hillside village in the Tatamelau Range. 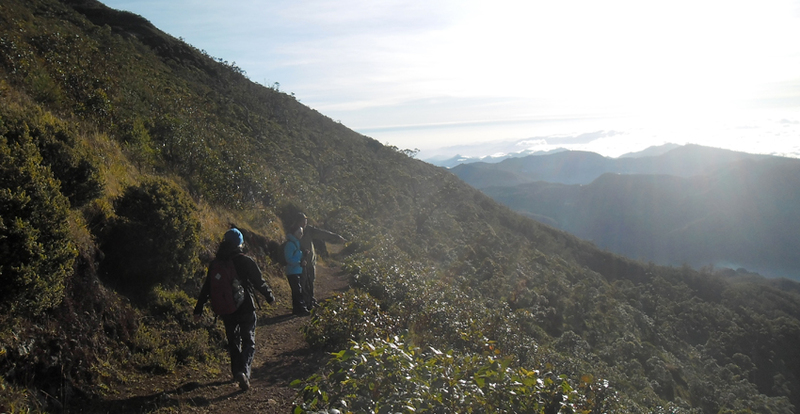 Ramelau is its highest peak. 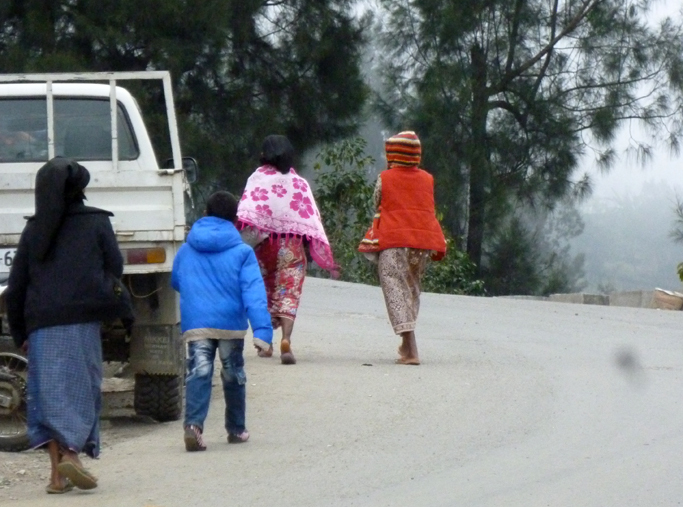 Locals rug up against the cold but jandals won’t keep their feet warm. 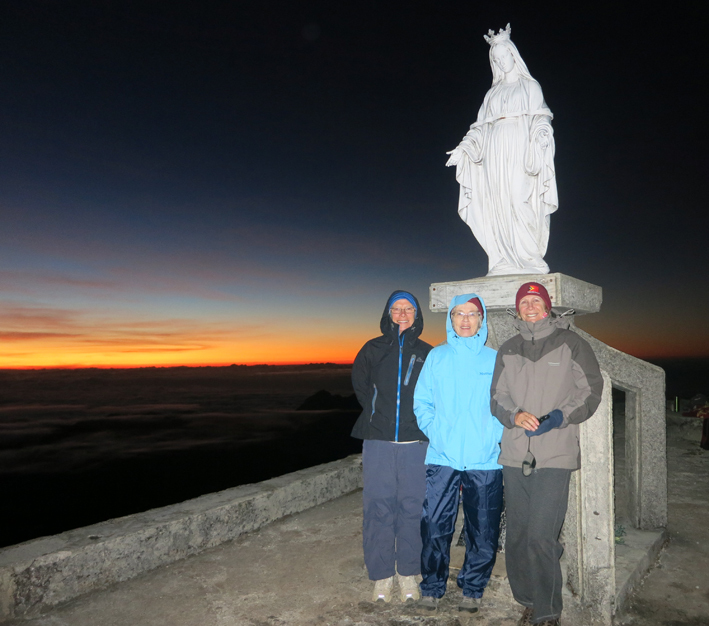 After a damp snooze in the run-down Pousada, we’re up at 3am to start our climb. It’s a two-hour slog in the dark: stone steps for the first 30 minutes, then a dirt track. The top’s clear but freezing and the beanies come into their own. From left: Julia, me and Del. 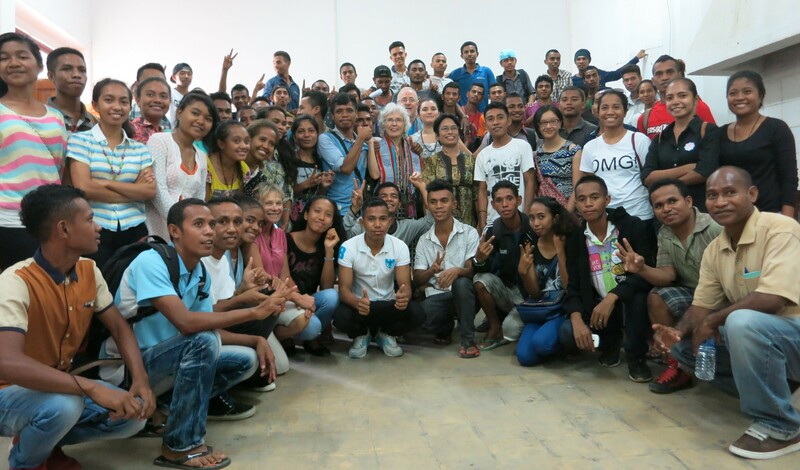 As the sky lightens, Pat and Del get a 360-degree view of TImor, including the south coast, the hills of Indonesian West Timor, and Atauro Island, 25km north of Dili. 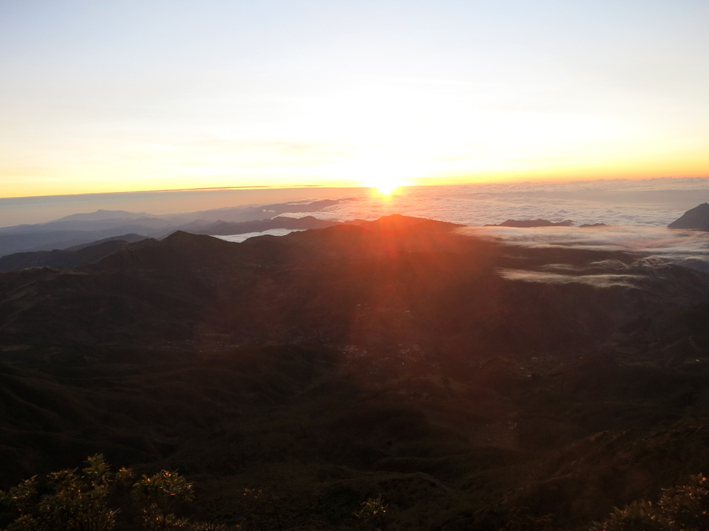 Sunrise over Timor is worth losing a night’s sleep over. 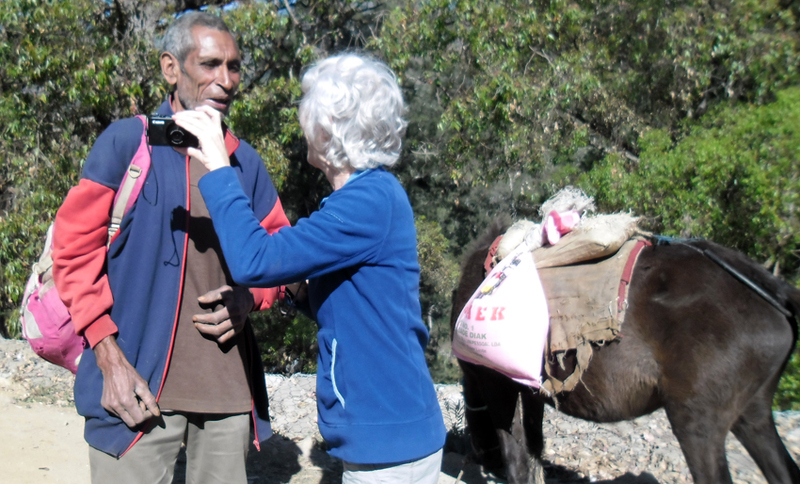 Our guide (left) has lived in Hato Builico all his life. 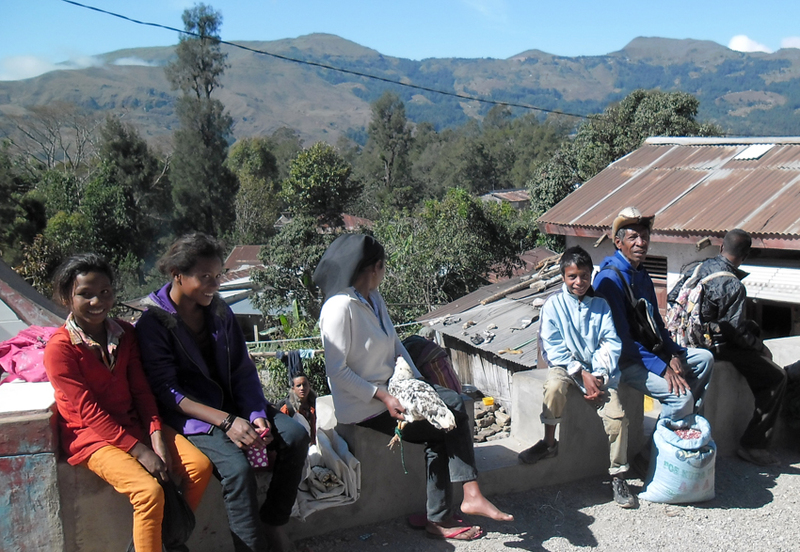 As a 12-year-old, he told us, he hid from Indonesian militia on Mt Ramelau with his family for two months. 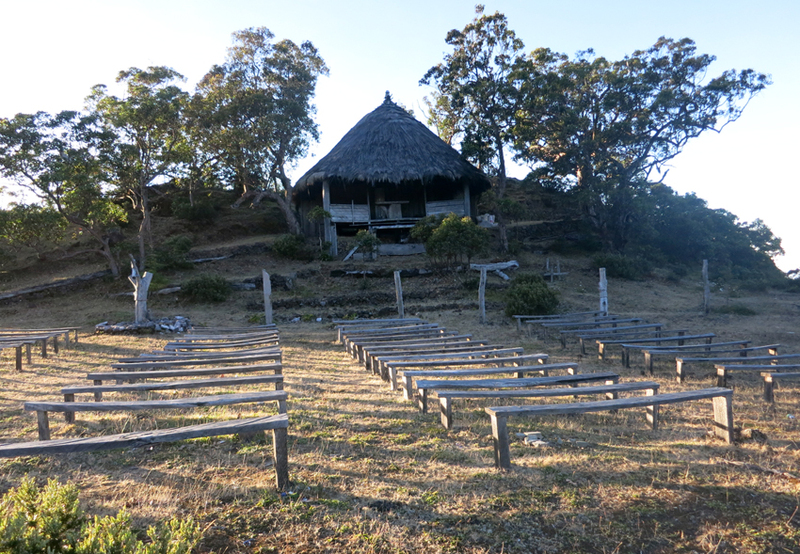 Merging old and new beliefs, Timorese have dedicated Mt Ramelau, the home of ancestors’ souls, to the Virigin Mary. 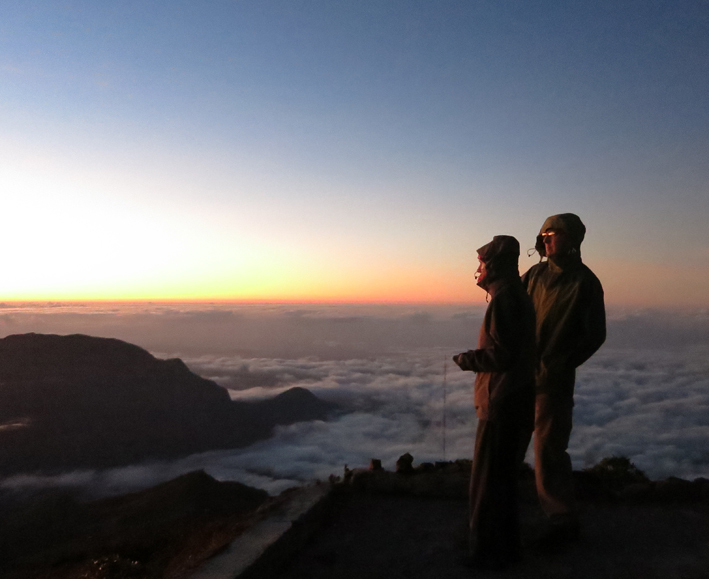 This three-metre statue on the summit was erected in 1997 during the Indonesian occupation. 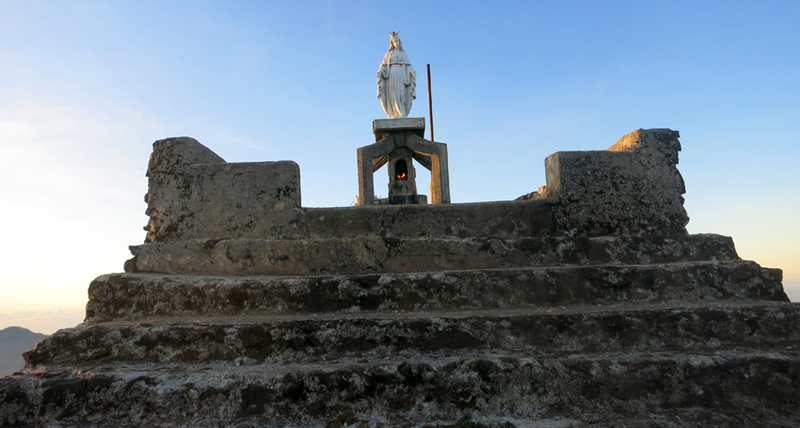 Our guide lit small white candles in the grotto before our descent. Mountain daisies and rolling hills mark the return trip. 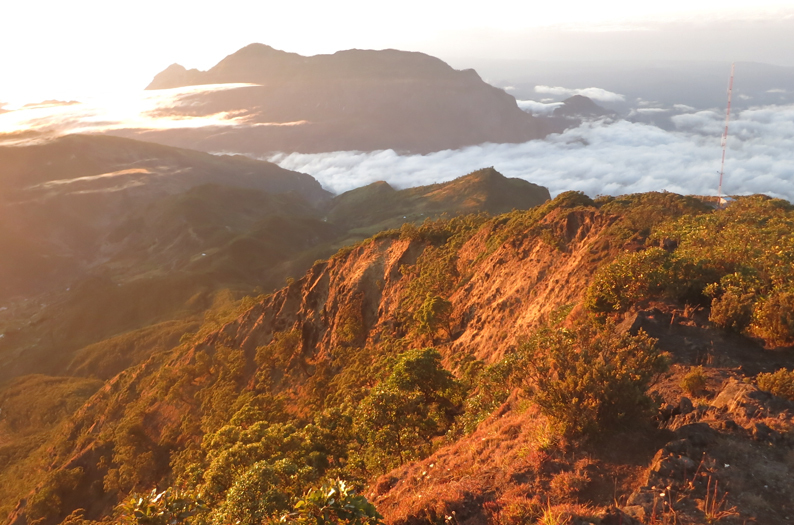 Timor’s mountainous terrain has been warmed by the sun for 30 million years. Heading down the eastern side of the mountain, the sun starts to thaw our bones. 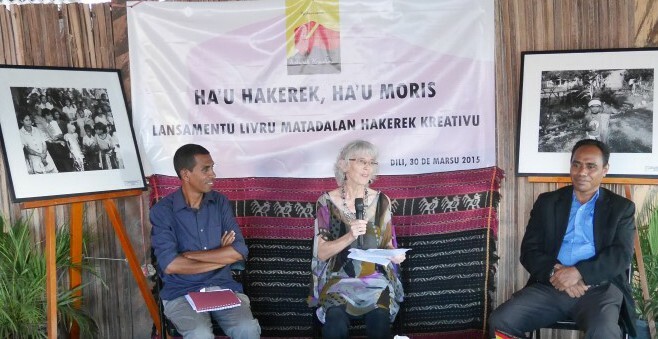 On 7 October, hundreds of Timorese make an annual pilgrimage up Mt Ramelau. 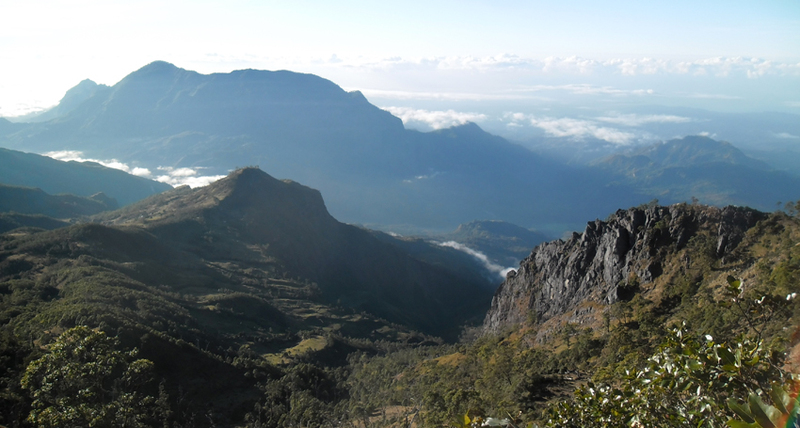 Open-air Masses are held at this site, 300m from the top. 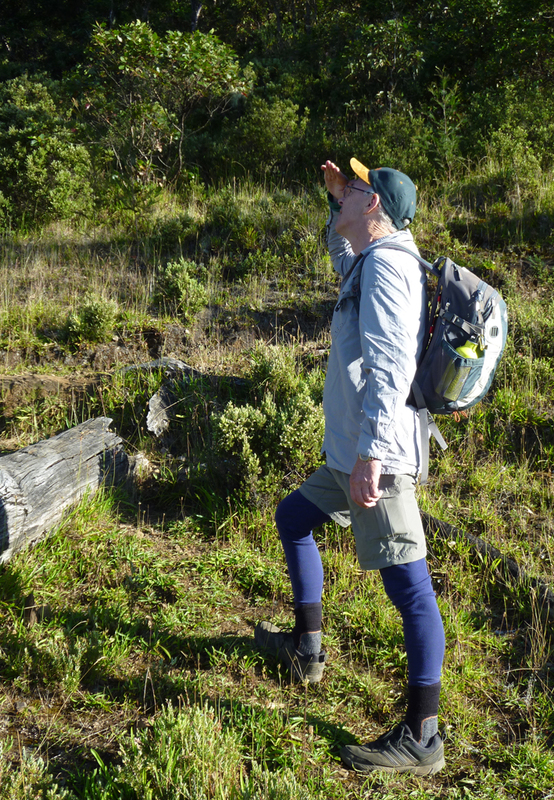 What the well-dressed tramper wears to keep the knees warm. 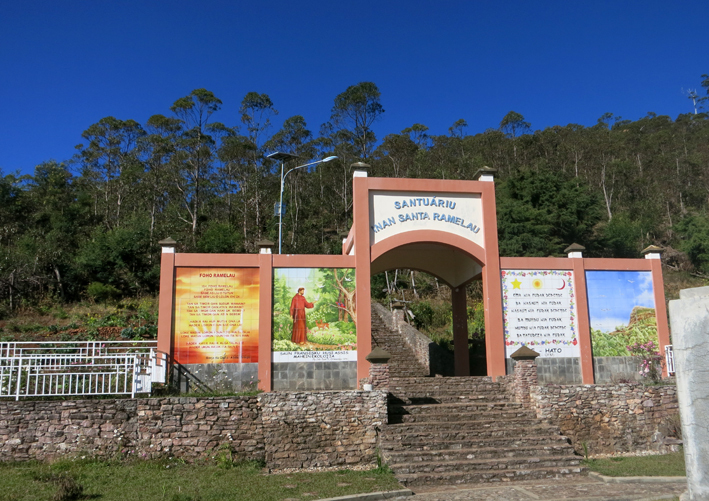 The colourful gateway to the mountain features prayers and a picture of St. Francis of Assisi. 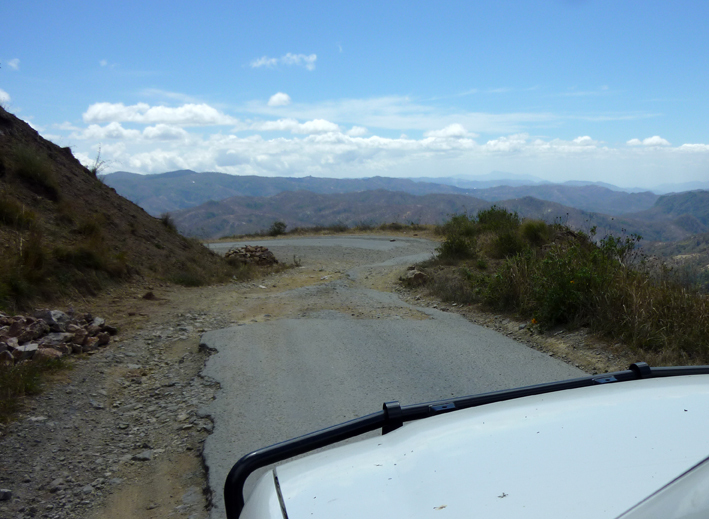 Looking back on the Ramelau peak, we drive away through the foothills. 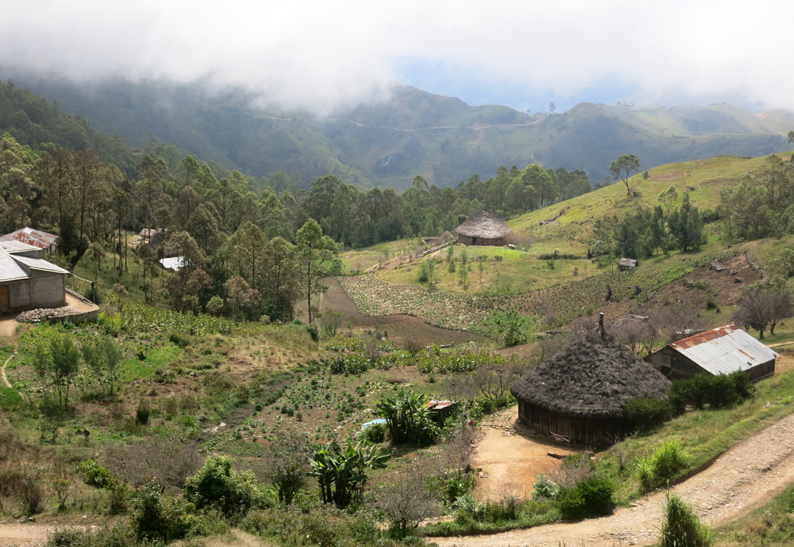 Traditional houses with thatched palm roofs dot the countryside. Our trusty driver Pat ferries us safely back to Maubisse along another awful road. 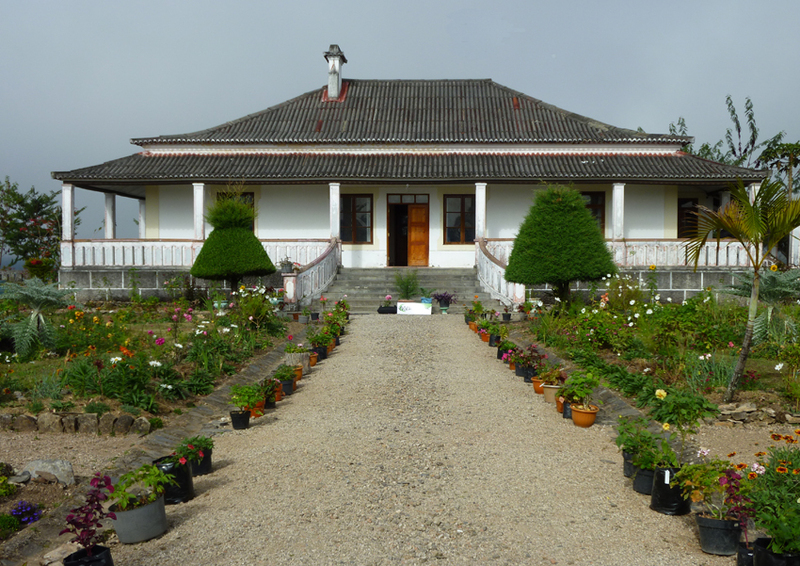 We stay at the grubby, over-priced Maubisse Pousada on Saturday night after our booking at a local guest house is usurped by the owner’s relatives. The grounds are still gorgeous and it has great views of the valley. 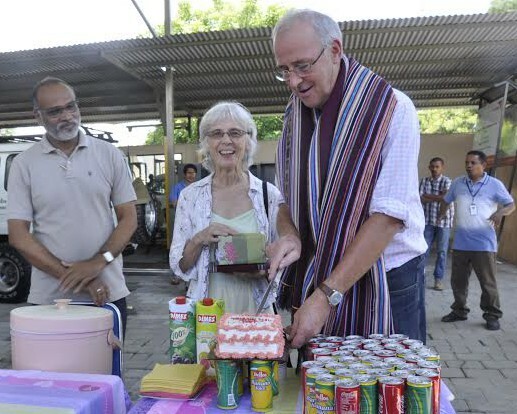 On Sunday morning, Julia and me wander through the Maubisse market, an exuberant affair which draws a big crowd. 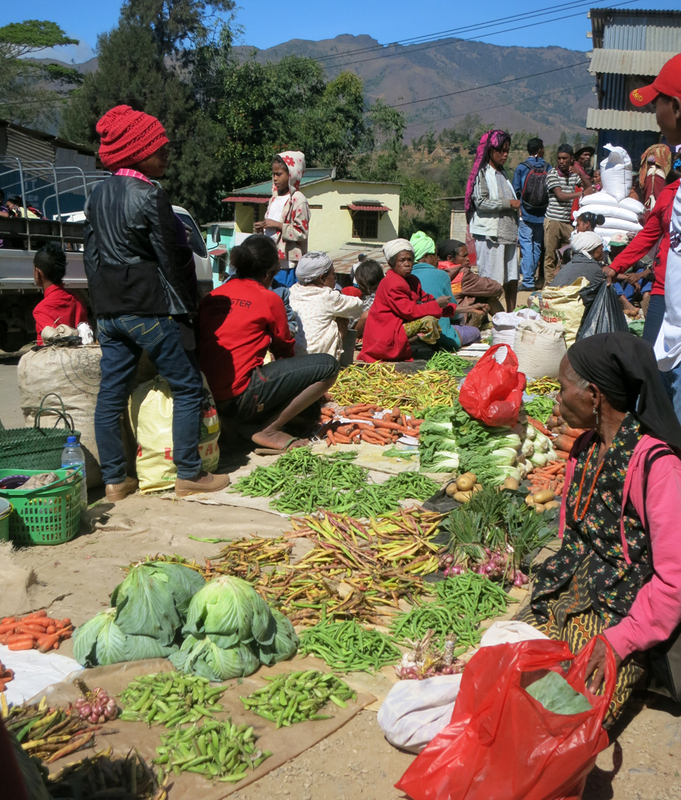 Sitting is a popular Maubisse pastime on market day. Still got it! The Blues Brothers Tony and Pat turn local girls’ heads. 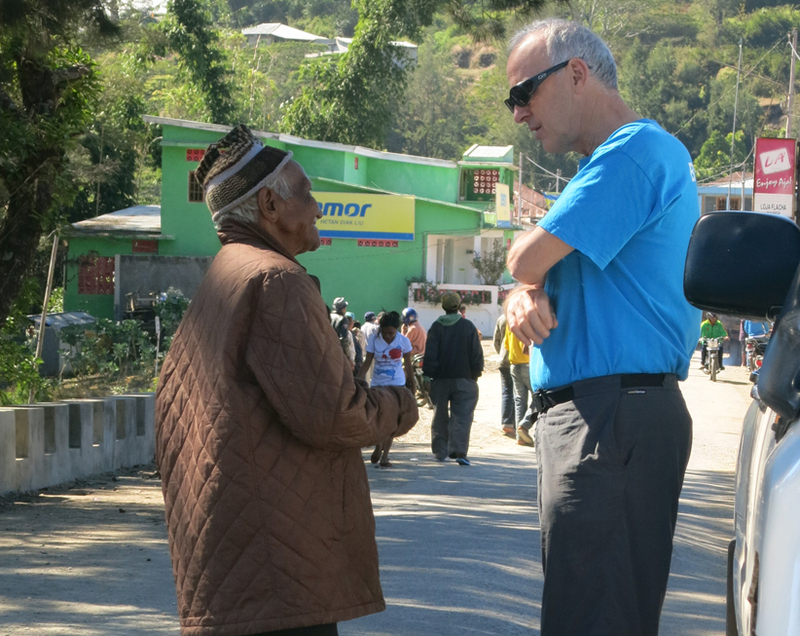 Pat’s shocked to hear from this elderly Timorese gent that the All Blacks and Wallabies have drawn 12-all. 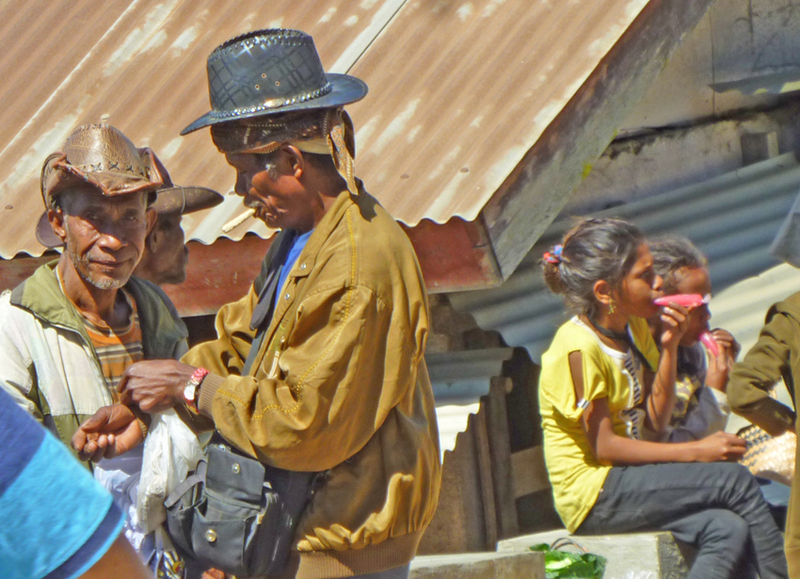 Timorese are remarkably generous about having their photo taken, although the Tetun term ‘hasai foto’ means ‘remove photo’. 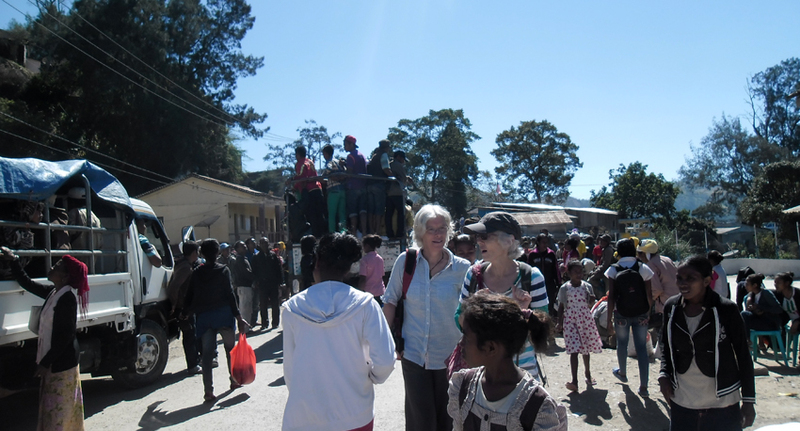 The pony’s laden with rice for the homeward trip..
Maubise feels like a frontier town, complete with cowboys. 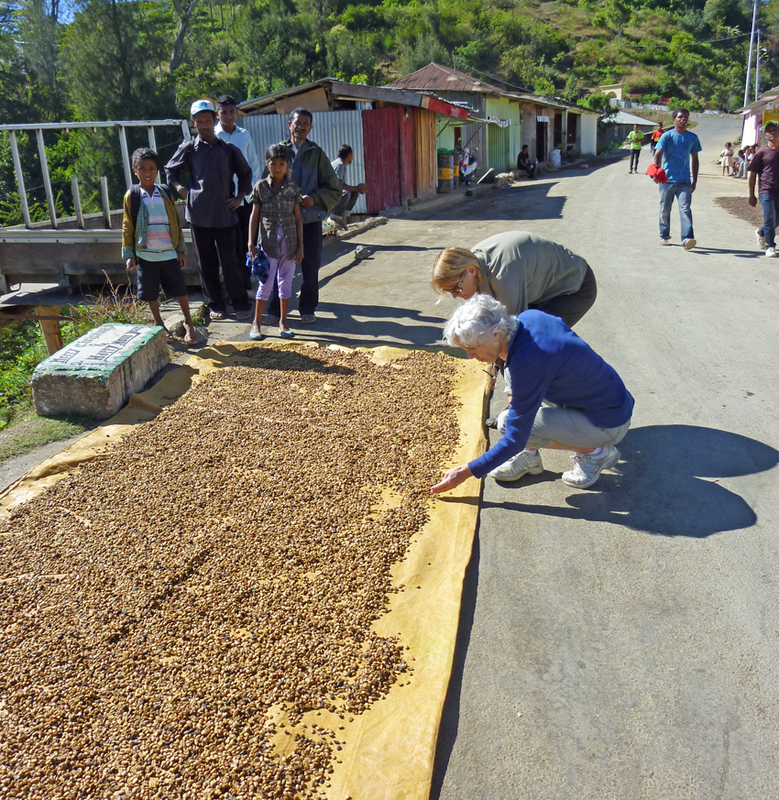 Del and I check out coffee beans drying on the road. 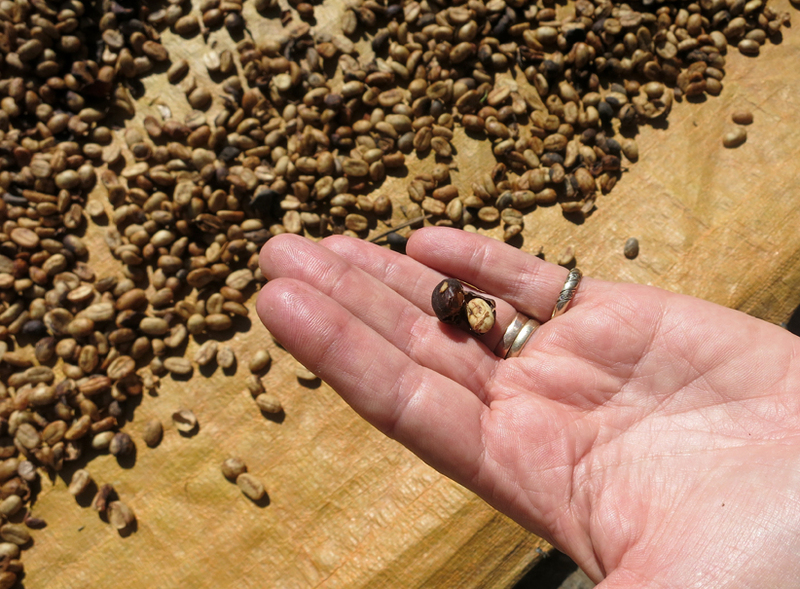 Each coffee pod produces two beans. 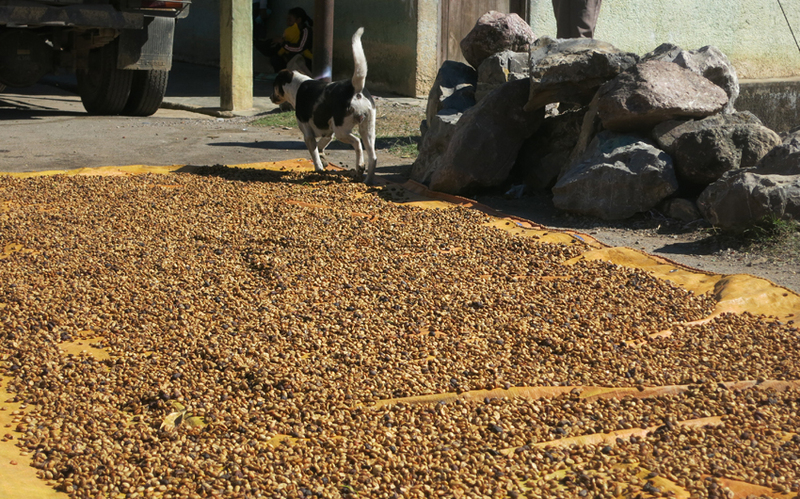 That distinctive TImor coffee flavour might contain a hint of canine. 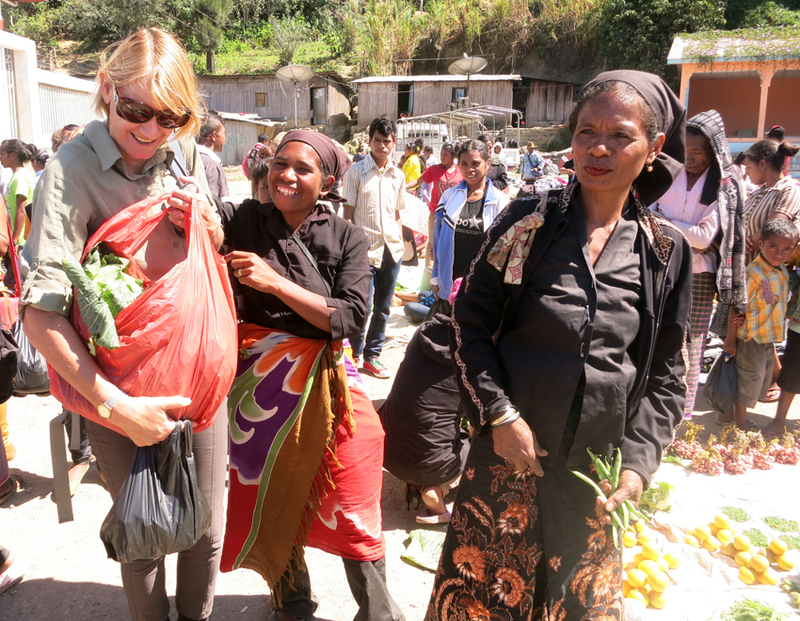 Fresh veges are a highlight of the Sunday market. Del buys cabbages and gains a new friend. 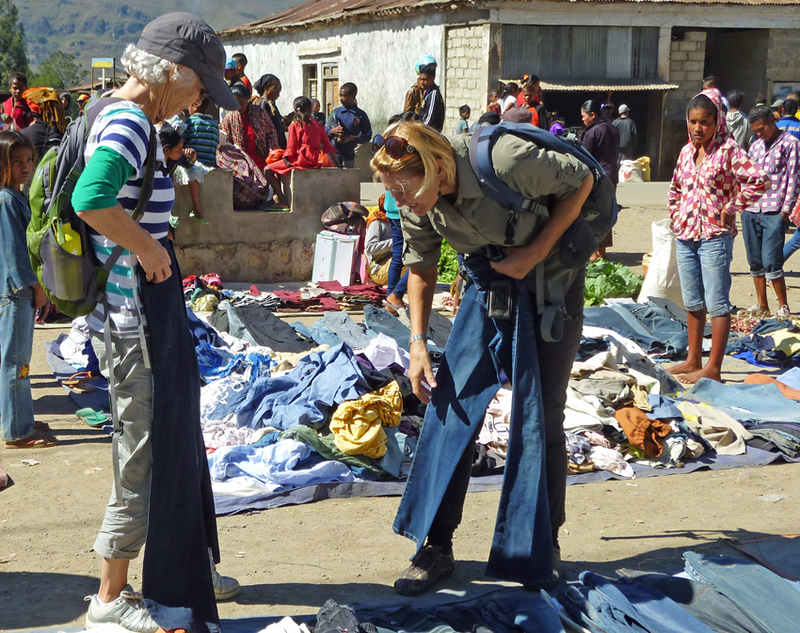 Then she helps me choose a pair of jeans for New York. 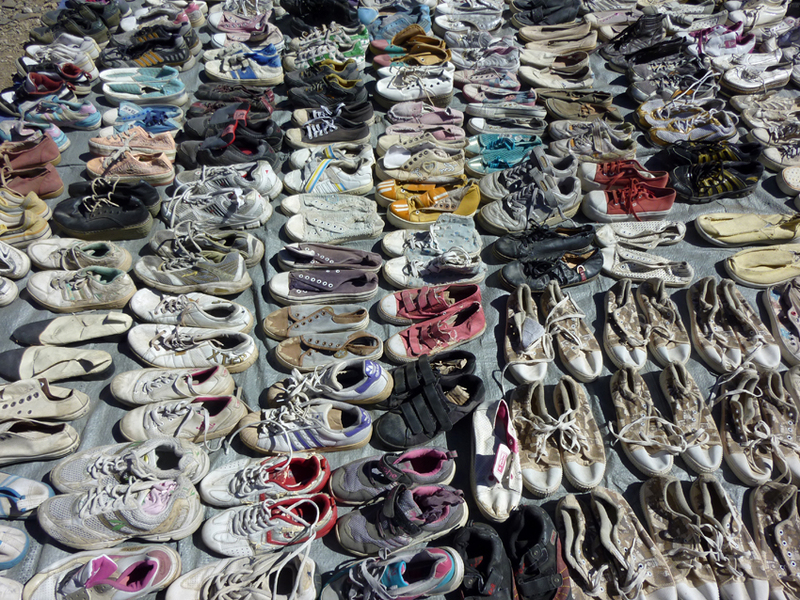 Thank heavens I didn’t need shoes or we’d still be there. 6am: It’s dark when Pat and I leave home to walk up the hill behind our house. 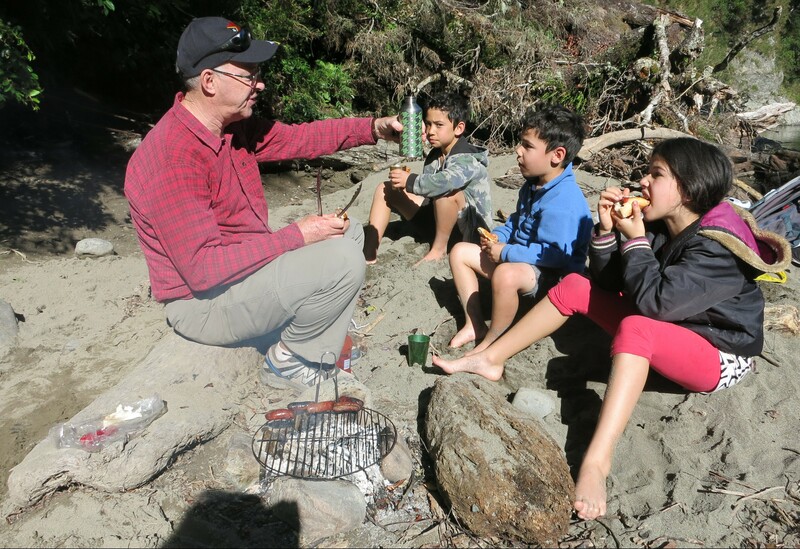 The roosters are already in full throttle and there’s a welcome coolness to the air. 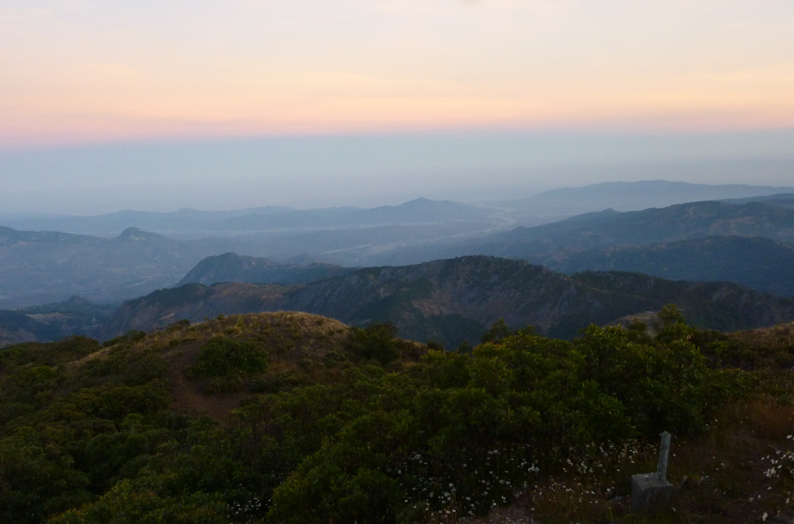 We scramble up a rocky path, past silent shacks, in time to see the sky turn orange above the hills of Cristo Rei. 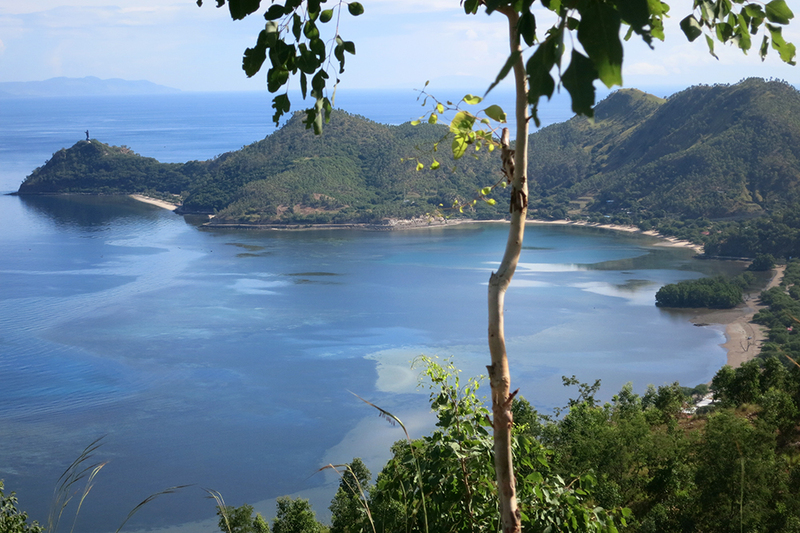 In the harbour below, container ships wait to unload almost everything Timor consumes, including rice from Vietnam, eggs from Singapore and clean water from Indonesia. Not much goes the other way.